It's thin, short, and energy-efficient, if not particularly fast. Even though Toshiba’s RC100 is the slowest NVMe SSD we’ve tested, it’s still a kick in the pants after SATA. And because it’s so thin and light, it’s a worthy laptop upgrade. The RC100 caught us just a tad off guard. We hadn’t seen a drive in the 2242 form factor (22mm wide, 42mm long) since...well, never. The longer 2280 form factor has been the name of the game around here since we started covering NVMe SSDs. 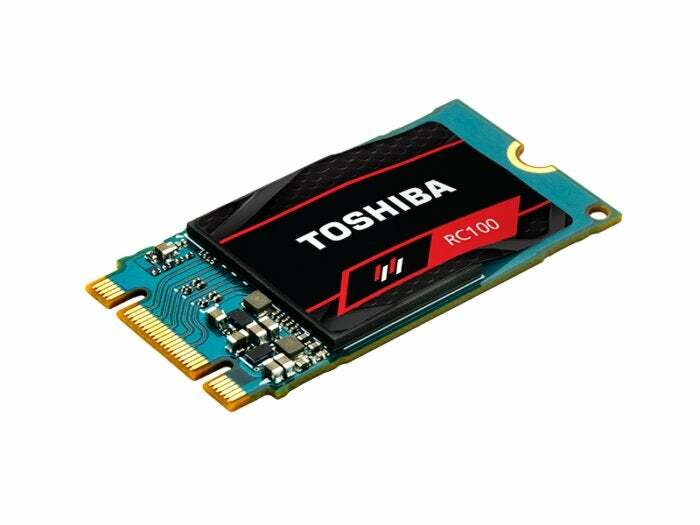 Despite its diminutive nature, the RC100 is available in capacities up to 480GB. Check out our regularly updated guide to the best SSDs for other storage options. As I said, the RC100 is a shorty. One might even say it’s cute. The drive is PCIe 3.0 using two lanes, rather than the four that enthusiast drives employ. This limits performance, but also reduces energy consumption, and most likely cost. The drive uses Toshiba’s own controller (which Toshiba wouldn’t specify after a query) and 64-bit BiCS 3D (Layered) TLC (Triple-level cell/3-bit) NAND. It’s available in 120GB, 240GB, and 480GB flavors. On Newegg they’re currently priced at $65, $95, and $190, respectively. Darn inexpensive, and we expect that to drop at least slightly as the market reacts. The drives carry a three-year warranty, and are rated for 1TBW (TeraBytes Written) for every 2GB of capacity—about par for the course. Note that the 120GB version is rated as significantly slower than the other capacities. This is often the case with smaller capacity SSDs that have fewer data channels and less cache. It’s no barn-burner, but that RC100 is an affordable way to leave SATA behind. To save on cost, it forgoes DRAM to use a small amount of system memory as cache. The RC100 has no DRAM for primary caching. Instead, it’s the first drive we’re aware of to take advantage of NVMe’s Host Memory Buffer feature. HMB allows a drive to use a portion of your computer’s system memory as a cache. This is largely what Samsung does with its RAPID software, though Toshiba told me this drive employs only 38MB’s worth. Using HMB obviously lowers costs, and for the average user, there’s minimal chance of losing data if the computer shuts down unexpectedly. About the only scenario that could cause data loss is exposure to fluids, which might short-circuit power to main memory immediately. Most motherboards retain power even when the power supply is shut off for at least a second or two, which should be plenty of time to clear a cache. While the 480GB version of the RC100 is the slowest NVMe SSD we’ve tested, it’s still quite a boost from SATA under normal conditions. That’s largely because Toshiba actually bestowed enough secondary NAND cache (some of the TLC treated as 1-bit Single Level Cell/SLC) on the drive—around 20GB—to handle the majority of write operations. As secondary cache (The HMB discussed above being the primary) is generally allotted as a fixed percentage of capacity, this is likely 10GB for the 240GB version, and 5GB for the 120GB model. 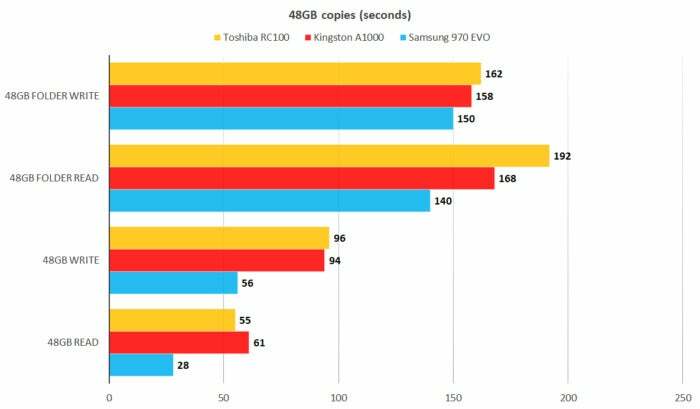 Generous cache or no, the RC100 (gold bars) is no match for a PCIe x4 drive such as the Samsung 970 EVO, or even Kingston’s PCIe x2 A1000 (red bars), as you’ll note from the results below. However, you still get incredible seek times (while on cache), which has a lot to do with the hyper-snappy feel that NVMe imparts to your system. Okay, the Samsung 860 EVO makes the RC100 look slow. Really slow, but in real life the difference will be hard to spot. Longer bars are better. Write performance does drop quite a bit when the RC100 runs out of cache, from 1GBps to around 400MBps. Few files or copy operations exceed that size, but you’re back to SATA speeds when they do. This is worst-case for the RC100 with unqueued writes. It’s never going to touch the 860 EVO in sustained throughput in synthetic benchmarks, but note that the EVO drops off significantly, just like the RC100 does, when you exceed the amount of cache on board. Longer bars are better. To reiterate, the RC100 is not a fast NVMe SSD, but it is fast compared to SATA and lightning-fast compared to the average hard drive while the cache is in play. The RC100 was more competitive in our real-world testing, though again, the 860 EVO smoked it in the read tests. Shorter bars are better. 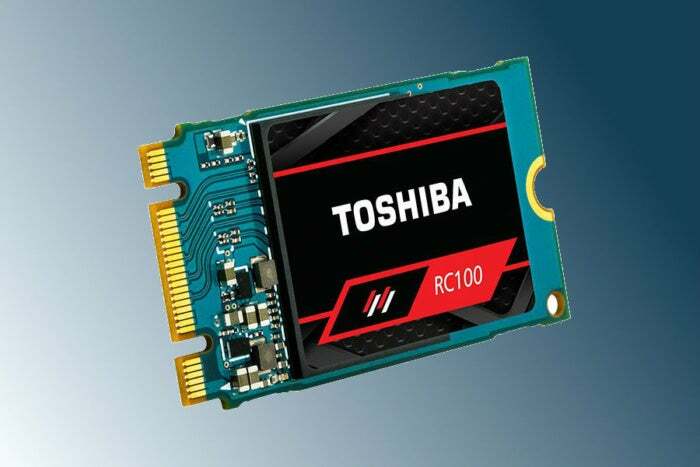 Toshiba claims that the RC100 uses only 70 percent of the juice of an enthusiast drive, though the company didn’t state which drives they consider enthusiast types. It’s likely true, as it’s leveraging only half the PCIe lanes and no DRAM. Above I talked about the seek times, They’re very good while the the RC100 is in cache, falling within the 0.1 ms to 0.3 ms window within which most drives perform. However, as with some other drives, notably Apacer’s Commando (over 9ms write seek) and Intel’s 760p (about 7ms write seek), it nose-dives when off of cache, to roughly 2.75ms in our tests. Bombarding a drive with that many consecutive seeks is not something your OS does, however, so take this as merely an informative hardware test—it will never affect you in real life. If you’re penny-pinching, or on a weight-reduction kick, the RC100 will save you quite a bit of coin and a gram or so. I’m giving it the nod with the caveat that it’s not as suitable for heavy workloads as the competition. It’s a very nice little upgrade drive—especially for laptops. 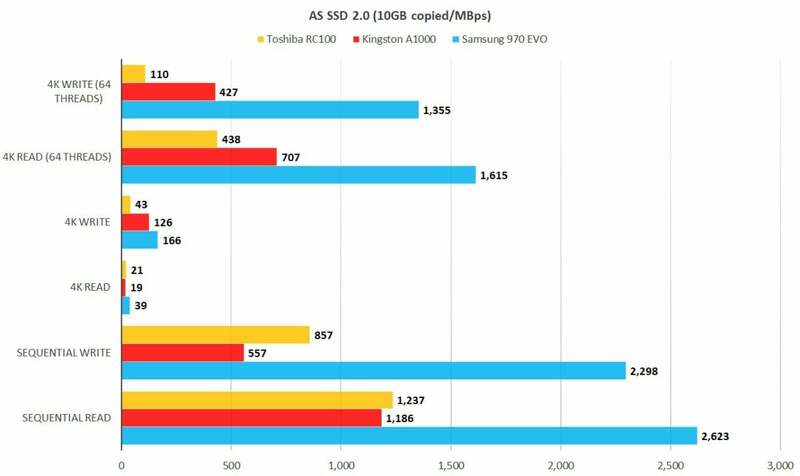 Even though Toshiba’s RC100 is the slowest M.2 NVMe SSD we’ve tested, it’s still a kick in the pants after SATA. And because it’s so thin and light, it’s a worthy laptop upgrade.